Various forms of Peer-Learning Environments are increasingly being used in postsecondary education, often to help build repositories of student generated learning objects. However, large classes can result in an extensive repository, which can make it more challenging for students to search for suitable objects that both reflect their interests and address their knowledge gaps. Recommender Systems for Technology Enhanced Learning (RecSysTEL) offer a potential solution to this problem by providing sophisticated filtering techniques to help students to find the resources that they need in a timely manner. Here, a new RecSysTEL for Recommendation in Peer-Learning Environments (RiPLE) is presented. The approach uses a collaborative filtering algorithm based upon matrix factorization to create personalized recommendations for individual students that address their interests and their current knowledge gaps. The approach is validated using both synthetic and real data sets. The results are promising, indicating RiPLE is able to provide sensible personalized recommendations for both regular and cold-start users under reasonable assumptions about parameters and user behavior. BARNES, T. 2005. The q-matrix method: Mining student response data for knowledge. In American Association for Artificial Intelligence 2005 Educational Data Mining Workshop. BARNES, T. 2010. Novel derivation and application of skill matrices: The q-matrix method. Handbook on educational data mining, 159–172. BATES, S. P., GALLOWAY, R. K., MCBRIDE, K. L., REBELLO, N. S., ENGELHARDT, P. V., AND SINGH, C. 2012. Student-generated content: Using peerwise to enhance engagement and outcomes in introductory physics courses. In AIP Conference Proceedings-American Institute of Physics. Vol. 1413. Citeseer, 123. BECK, J. E. AND CHANG, K.-M. 2007. Identifiability: A fundamental problem of student modeling. In International Conference on User Modeling. Springer, 137–146. BESWICK, G., ROTHBLUM, E. D., AND MANN, L. 1988. Psychological antecedents of student procrastination. Australian psychologist 23, 2, 207–217. BETTS, B. 2013. Towards a method of improving participation in online collaborative learning: Curatr. Teaching and Learning Online: New Models of Learning for a Connected World 2, 260. BIGGS, J. 1999. What the student does: teaching for enhanced learning. Higher education research & development 18, 1, 57–75. BOUD, D., COHEN, R., AND SAMPSON, J. 2014. Peer learning in higher education: Learning from and with each other. Routledge. CAZELLA, S., REATEGUI, E., AND BEHAR, P. 2010. Recommendation of learning objects applying collaborative filtering and competencies. In Key Competencies in the Knowledge Society. Springer, 35–43. CECHINEL, C., SICILIA, M.-A., S ´ A´ NCHEZ-ALONSO, S., AND GARC´IA-BARRIOCANAL, E. 2013. Evaluating collaborative filtering recommendations inside large learning object repositories. Information Processing & Management 49, 1, 34–50. CHEN, C.-M. 2008. Intelligent web-based learning system with personalized learning path guidance. Computers & Education 51, 2, 787–814. CHIN, C. AND BROWN, D. E. 2002. Student-generated questions: A meaningful aspect of learning in science. International Journal of Science Education 24, 5, 521–549. COETZEE, D., LIM, S., FOX, A., HARTMANN, B., AND HEARST, M. A. 2015. Structuring interactions for large-scale synchronous peer learning. In Proceedings of the 18th ACM Conference on Computer Supported Cooperative Work & Social Computing. ACM, 1139–1152. Conference on Intelligent Tutoring Systems. Springer, 406–415. DENNY, P., HAMER, J., LUXTON-REILLY, A., AND PURCHASE, H. 2008. Peerwise: students sharing their multiple choice questions. In Proceedings of the fourth international workshop on computing education research. ACM, 51–58. DESMARAIS, M. C. 2012. Mapping question items to skills with non-negative matrix factorization. ACM SIGKDD Explorations Newsletter 13, 2, 30–36. DESMARAIS, M. C., BEHESHTI, B., AND NACEUR, R. 2012. Item to Skills Mapping: Deriving a Conjunctive Q-matrix from Data. Springer Berlin Heidelberg, Berlin, Heidelberg, 454–463. DESMARAIS, M. C. AND NACEUR, R. 2013. A Matrix Factorization Method for Mapping Items to Skills and for Enhancing Expert-Based Q-Matrices. Springer Berlin Heidelberg, Berlin, Heidelberg, 441–450. DESMARAIS, M. C. AND PELCZER, I. 2010. On the faithfulness of simulated student performance data. In Educational Data Mining 2010. DRACHSLER, H., VERBERT, K., SANTOS, O. C., AND MANOUSELIS, N. 2015. Panorama of recommender systems to support learning. In Recommender systems handbook. Springer, 421–451. DRASGOW, F. AND HULIN, C. L. 1990. Item response theory. ERDT, M., FERNANDEZ ´ , A., AND RENSING, C. 2015. Evaluating recommender systems for technology enhanced learning: A quantitative survey. IEEE Transactions on Learning Technologies 8, 4, 326–344. FAZELI, S., LONI, B., DRACHSLER, H., AND SLOEP, P. 2014. Which recommender system can best fit social learning platforms? In European Conference on Technology Enhanced Learning. Springer, 84–97. GANTNER, Z., RENDLE, S., FREUDENTHALER, C., AND SCHMIDT-THIEME, L. 2011. Mymedialite: a free recommender system library. In Proceedings of the fifth ACM conference on Recommender systems. ACM, 305–308. GOMEZ-ALBARRAN, M. AND JIMENEZ-DIAZ, G. 2009. Recommendation and students’ authoring in repositories of learning objects: A case-based reasoning approach. International Journal of Emerging Technologies in Learning. HARDY, J., BATES, S. P., CASEY, M. M., GALLOWAY, K. W., GALLOWAY, R. K., KAY, A. E., KIRSOP, P., AND MCQUEEN, H. A. 2014. Student-generated content: Enhancing learning through sharing multiple-choice questions. International Journal of Science Education 36, 13, 2180–2194. IMRAN, H., BELGHIS-ZADEH, M., CHANG, T.-W., GRAF, S., ET AL. 2016. Plors: a personalized learning object recommender system. Vietnam Journal of Computer Science 3, 1, 3–13. LEMIRE, D., BOLEY, H., MCGRATH, S., AND BALL, M. 2005. Collaborative filtering and inference rules for context-aware learning object recommendation. Interactive Technology and Smart Education 2, 3, 179–188. LUMEZANU, C., LEVIN, D., AND SPRING, N. 2007. Peerwise discovery and negotiation of faster paths. In HotNets. Citeseer. MANGINA, E. AND KILBRIDE, J. 2008. Evaluation of keyphrase extraction algorithm and tiling process for a document/resource recommender within e-learning environments. Computers & Education 50, 3, 807–820. MANOUSELIS, N., DRACHSLER, H., VUORIKARI, R., HUMMEL, H., AND KOPER, R. 2011. Recommender systems in technology enhanced learning. In Recommender systems handbook. Springer, 387–415. PARDOS, Z. A. AND HEFFERNAN, N. T. 2010. Using hmms and bagged decision trees to leverage rich features of user and skill from an intelligent tutoring system dataset. Journal of Machine Learning Research W & CP. PURCHASE, H., HAMER, J., DENNY, P., AND LUXTON-REILLY, A. 2010. The quality of a peerwise mcq repository. In Proceedings of the Twelfth Australasian Conference on Computing Education-Volume 103. Australian Computer Society, Inc., 137–146. RICCI, F., ROKACH, L., AND SHAPIRA, B. 2011. Introduction to Recommender Systems Handbook. Springer US, Boston, MA, 1–35. ROSENSHINE, B., MEISTER, C., AND CHAPMAN, S. 1996. Teaching students to generate questions: A review of the intervention studies. Review of educational research 66, 2, 181–221. SALEHI, M. 2013. Application of implicit and explicit attribute based collaborative filtering and bide for learning resource recommendation. Data & Knowledge Engineering 87, 130–145. THAI-NGHE, N., DRUMOND, L., HORVATH ´ , T., KROHN-GRIMBERGHE, A., NANOPOULOS, A., AND SCHMIDT-THIEME, L. 2011. Factorization techniques for predicting student performance. Educational Recommender Systems and Technologies: Practices and Challenges, 129–153. THAI-NGHE, N., HORVATH ´ , T., AND SCHMIDT-THIEME, L. 2010. Factorization models for forecasting student performance. In Educational Data Mining 2011. VERBERT, K., DRACHSLER, H., MANOUSELIS, N., WOLPERS, M., VUORIKARI, R., AND DUVAL, E. 2011. Dataset-driven research for improving recommender systems for learning. In Proceedings of the 1st International Conference on Learning Analytics and Knowledge. ACM, 44–53. WINTERS, T. E. 2006. 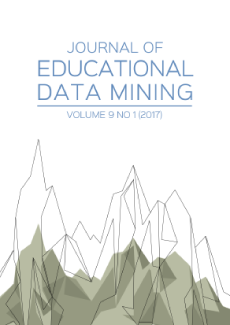 Educational data mining: collection and analysis of score matrices for outcomes-based assessment. Ph.D. thesis, Citeseer. WRIGHT, J. R., THORNTON, C., AND LEYTON-BROWN, K. 2015. Mechanical ta: Partially automated high-stakes peer grading. In Proceedings of the 46th ACM Technical Symposium on Computer Science Education. ACM, 96–101.